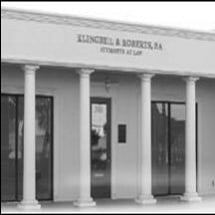 The law firm of Klingbeil & Roberts, P.A. primarily practices in the areas of estate planning, wills and trusts, probate administration, and guardianship. In addition, we have an extensive real estate practice which includes the preparation of real estate contracts, the closing of real estate transactions and issuing title insurance for commercial and residential properties. Both members of the law firm are member agents for Attorneys' Title Insurance Fund, Inc. The law firm also represents small businesses in the greater Venice area and handles the various corporate and legal needs of these businesses.